Are you thinking about entering the lucrative field of technology? Before doing so, you’re probably keen to know what IT salaries in South Africa are really like. The good news is that MyBroadband recently completed their 2018 IT Salary Survey, which interviewed 2,695 respondents. Let’s see what the results showed. 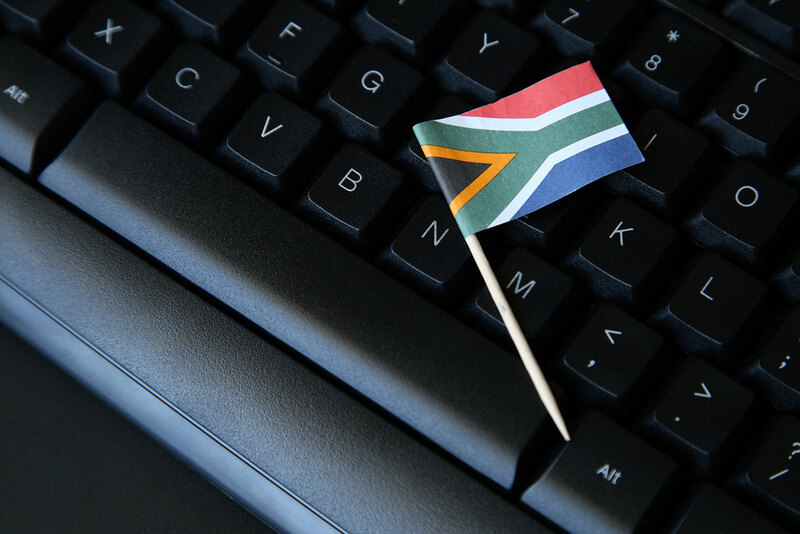 According to the Salary Survey, the average salary for South African IT professionals has increased from 2017 to 2018 – it’s up from R41,555 to R42,673 per month. Let’s compare this to the average salary for South Africans. Stats SA reports that the average monthly salary decreased from R20,060 in November 2017 to the February 2018 salary of R19,858, as reported in BusinessTech. There is some controversy, however. BankservAfrica reports the average salary is significantly lower at R13,621 a month – which equates to R163,450 a year. Either way you look at it, IT salaries in South Africa are a lot higher. The average salary increase during this period was 8.7%. Last year, 60% of IT professionals received a bonus. As far as perceptions go, 55% of IT professionals think their salary is fair, while 43% believe they are underpaid, and 2% think they are overpaid. Here’s a table showing the gross monthly salary for various IT professionals. To interpret that data, know the following: Entry-level (little experience, 10th percentile), Experienced (relevant experience, 25th percentile), Mid-level (5-10 years relevant experience), Senior (senior level, 75th percentile), High-end (very senior, 90th percentile). CareerJunction released its 2018 Salary Review survey based on 16 000 job posts. Here’s what they found regarding geographical differences in IT salaries in South Africa. Perhaps as expected, the Western Cape and Gauteng remain the best locations as far as salary goes for IT professionals. “Salaries in these regions are very close to the national average, while salaries in KwaZulu-Natal are not nearly as competitive,” said CareerJunction. 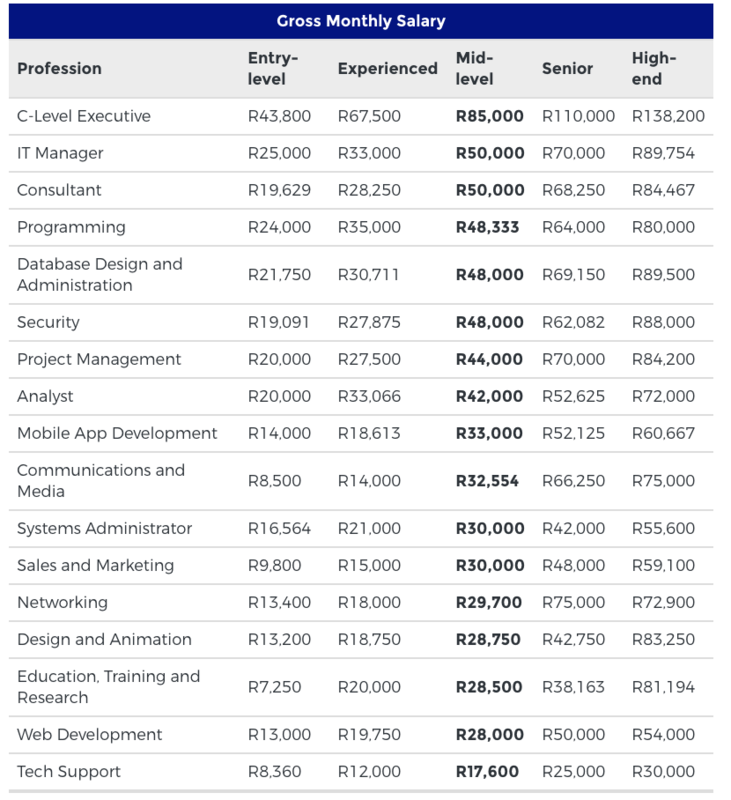 OfferZen has conducted similar research and found that Cape Town entry level salaries for developers are on average 14% higher than their Northern cousins: Joburgers starting out can expect to earn about R22 000 per month, while developers in Cape Town earn, on average, about R25 000 per month. However, at the 4-6 year experience mark, Joburg takes the lead: with more than 6 years of experience, the average monthly salary for Joburg developers is R61,240, whereas Cape Town developers with the same number of years of experience earn on average R54,750 per month. Essentially, entry level salaries for developers are better in Cape Town; however, the more years of experience you gain, the better off you are salary-wise in Johannesburg. One potential reason for this is the high number of large financial institutions in Joburg. In addition to the languages, Cape Town also currently has “high demand for UX Designers, Python, and PHP developers,” states co-founder Philip Joubert from OfferZen in My Broadband. In conclusion, IT salaries in South Africa look healthy; they are certainly better than the national average. If you’re thinking about entering the lucrative field of programming, consider signing up at HyperionDev with one of their part-time online coding bootcamps in Full Stack Web Development, Mobile Development or Software Engineering. Alternatively, if you’re keen to equip yourself with valuable data science skills and tools required to think like a data scientist, pre-register for HyperionDev’s brand new data science bootcamp today. You’ll learn about machine learning, data analysis and bioinformatics to prepare you for your career as a data scientist.